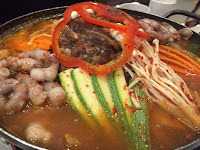 Cho Sun Ok in Markham was my first taste of Korean food that wasn't called Korean BBQ. In a large group, as usual, we wanted a good variety of what they had to offer. We'd heard a lot about their soup, so off we went. We chose 2 types of soup(Bul Nak Jeongul – seafood & Soondae Gook – pig organ sausage), a cold noodle slush and Dolsot bibimbap. Keeping in mind I'm the new kid on the block, everything was new to me(except the bibimbap). The cold noodles were bizarre; I've never had an entrée that was intentionally cold. The black noodles weirded me out a bit, unexpected. It was a new experience, but it was good! The noodles were tasty as well and the slushy broth. 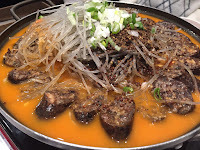 When you are eating a lot of spicy soup, having the cold noodle option was great. The soups were actually too spicy for me. I'm a wuss, I know! If you're not someone that likes spicy food, this is not the place for you. Even the soups that had a lower heat rating were too hot for someone like me. All the spice lovers seemed to enjoy them. They were all served in large pots on a burner keeping them ready to eat. They bowls were brimming with the soups' ingredients and they smelled divine. 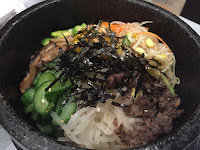 The bibimbap was good, but not special. It was nice to have something I could eat comfortably, but I found it a bit bland. As usual, people battled it out for the crunchy rice at the end! I ended up eat a lot of their side dishes. Can't get enough of those radishes! I've seen a lot of comments about service, but they were pretty attentive. We didn't wait long after asking for more water or side dishes. It wasn't very busy that night, but the flow of people was pretty consistent. 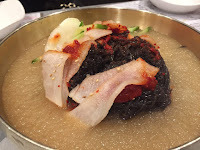 I need to go to another Korean restaurant so I have something to compare it to! Any suggestions?